Commodore launched its range of PC-compatible systems at the height of the company�s popularity, with home and business systems being sold in over 50 countries. 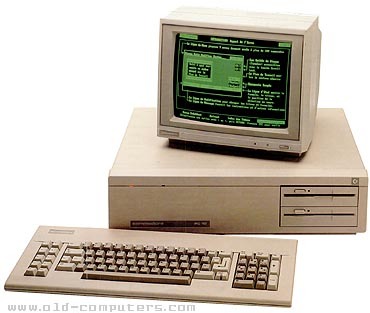 Commodore was the largest seller of computer systems in the world with sales in excess of $1 billion. Regardless, Commodore eventually suffered from permanent financial and structural problems. - PC-1 A very small PC-compatible with a 4.77MHz 8088 processor (without turbo clock), a single 5.25� FDD, 512KB of RAM, and Hercules/GCA video board. The PC-1 lacked any internal expansion slots or cooling fans. - PC-10 A basic 8088-based PC-compatible system with 1 or 2 floppy drives (page photo). - Colt A re-branded version of the PC-10 system. - PC-20 Identical to the PC-10 system, but included a 20MB hard disk. - PC-30 PC-AT 12 MHz 80286-based system including a 20MB hard disk. Probably the same machine as the PC-35 but only sold in Europe. - PC-35 Same features as the PC-30. - PC-40 PC-AT 10 MHz system with 1 MB RAM, Hercules/CGA video card, and a 20MB to 80MB hard disk. A jumper setting allowed the memory to be configured between 640KB or 512KB + 512KB of extended memory. - PC-50 80386SX 16 MHz system with a 40MB to 100MB hard disk. - PC-60 80386 25 MHz system with a tower case and a 60MB to 200MB hard disk. As an engineer back in the late 80s I installed, maintained and repaired commodore PC's. It was not a specific exciting or revolutionary computer but merely a good working IBM clone which evolved likewise. The PC10 however did gave me some strange problems due to the position of the double floppy drives, see the gap between them in the picture. see more Commodore PC Compatible systems Ebay auctions !